I mentioned that possibility in a previous post, and I finally did it: A barefoot hike on suicide cliff! 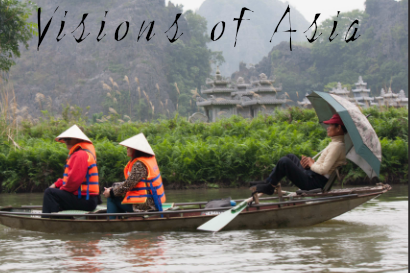 Originally, I wanted to test myself with a barefoot hike on a less steep terrain, such as the Dragon’s Back hike. Seeing how packed that hike can be on weekends, I decided instead to do the suicide cliff. I am probably the first (maybe will remain the only!) to pull off this feat. Disclaimer: this post does not mean to incite you to replicate the fact without proper preparation/training. For the record, this is a trail I covered five or six times this year with trail running shoes or hiking boots each time, so I knew the terrain and the risks beforehand. I also took it slow and easy and did not seek for thrills. Lightness was the key to going barefoot. As most of the previous times, I had packed around 15 kgs of photographic gear (and a tripod), this time, with bare feet, lightness was a must, otherwise, the impact when descending might have been increased with the weight supported (not to mention balance would be off by a degree). Originally, I wanted to take a hiking pole, but then decided against it as most of the uphill route involves using your hands to push on rocks. I just packed a camera, 1.5 l. water and some change of clothes. In winter, at least, the temperature is far from that sweltering heat of the summer, but it is still a hike that demands some work as it is a continuous climb from the start to the top. However, I would say that we are in the golden season for this hike, as temperatures are moderate and ground is dry. Still, despite this, I sweated quite a bit due to the effort. But let’s get to the nitty-gritty of this hike: how did I make it barefoot? Why doing the hike barefoot? 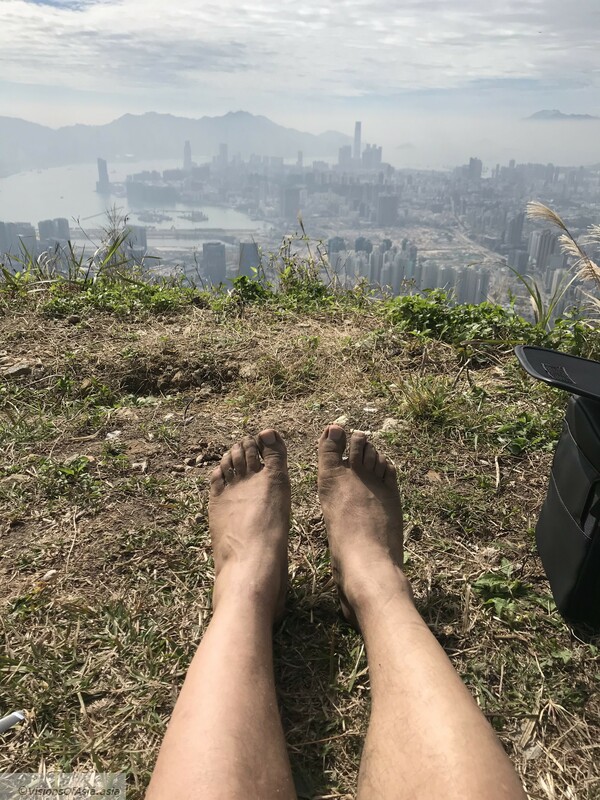 I explained before when relating my hike on Kowloon Peak, I started running barefoot a month ago. This allowed me to strengthen immensely my feet and my overall form. The other point was that I got really fed up with the hiking meetups to which I participated. Half or three quarters of the participants were doing more of a trail running than real hiking. In a very Hongkongese manner, hiking is something to be completed asap and almost “business-like”. And otherwise, you will pollute the whole atmosphere with music boxes because you are “bored”. The concept of admiring or communing with nature is totally unheard of. 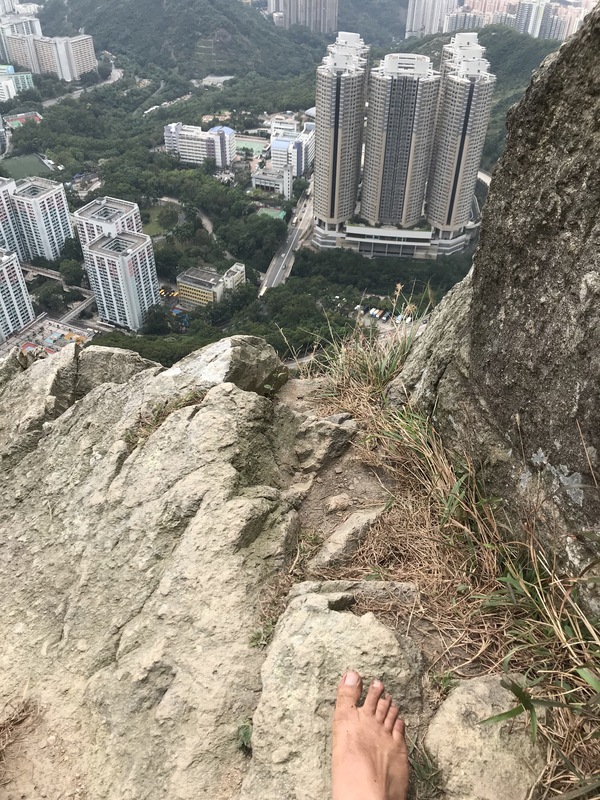 Doing a barefoot hike on suicide cliff is a way of opening your mind to everything that surrounds you and to the sensations of your body (you better listen to your feet!). It is also a very nice tactile feel. And finally, it was an achievement I wanted to realize after climbing so often on suicide cliff. And last but not least, you are obliged to take it slow and deliberately and look where you place your feet. Despite all this, I kept ahead of two other shod hikers who started about five minutes after me. If you have not yet done this hike, then let me give you a tip: most of the climb is made of small nooks in which you must place your feet. I did this hike with hiking boots, with trail running shoes and barefoot. Of all these times, it was the easiest when I climbed with trail running shoes and barefoot. In fact, the feet and its plant, in particular, do a good job of nestling into the limited space left in the rock. Hiking boots and their rigid sole make it much more difficult to climb. Furthermore, on delicate passages, where you might lose balance because your shoe is in equilibrium, the bare foot does claw around the rock to keep you stable. Obviously, you will never hike barefoot if you are focused on completing a trail fast. You must be careful where you place your feet. You cannot kick or throw your feet anyhow, unless you wish to hurt them. Because of this, hiking barefoot is a form of hiking that has less impact on the environment. My feet left a minimum impact on the trail (which is worryingly suffering some heavy erosion with the huge number of hikers). I hiked alone, but this was not much of a danger on a week-end, given the number of hikers taking this trail (sometimes, there is a real queue for getting to the suicide cliff). A delicate passage is the sandy (and eroded!) path near suicide cliff itself. You must hold yourself with hands and/or a hiking pole, because, obviously, the sand is quite slippery. Another important point is never to jump or land heavily. I would say that the barefoot hiking style would be akin to a puma progressing in the mountain (your steps and progression must be smooth and feline). I must however point out that the way down (via the stairs to Fei Ngo shan road) is otherwise more demanding when barefoot. As a number of wooden stairs have been worn out on the trail, all that is left in some places are protruding metal bars (there is metal also on the existing stairs, but as they just appear as bolts, the feet just adapt around). Those metal bars when uncovered could easily injure someone absent-minded or tired (but so could a heavy landing on rocks). So, I would recommend wearing shoes in any case to go down (even if I did not follow that advice!). Again, as previously exposed, reactions vary. Generally, surprise and admiration are superior to the people taking you for a madman. A girl asked me if this was a challenge. Another group admired the feat, with one lady commenting that it must be very painful. I answered that it was not as I run barefoot. But as I also mentioned earlier, you must have the strength of will to withstand criticism and be confident even without shoes. On the point of pain, if you are not accustomed to run barefoot, if you have tender untouched feet, do not try this at all. You must be accustomed to bearing your weight on reflexology stones touching your feet (many paths available in HK’s parks). You should be able to walk on one without wincing or being obliged to move to avoid the pain. Why is that? Simply because on the mountain, you might land on stones. When accustomed, your feet will shift the weight around that protruding intruder. It may be a sort of pressure induced on your feet, but if unaccustomed, it might feel a lot like pain. As such, when unprepared, you might be thrown off balance and lose your footing. 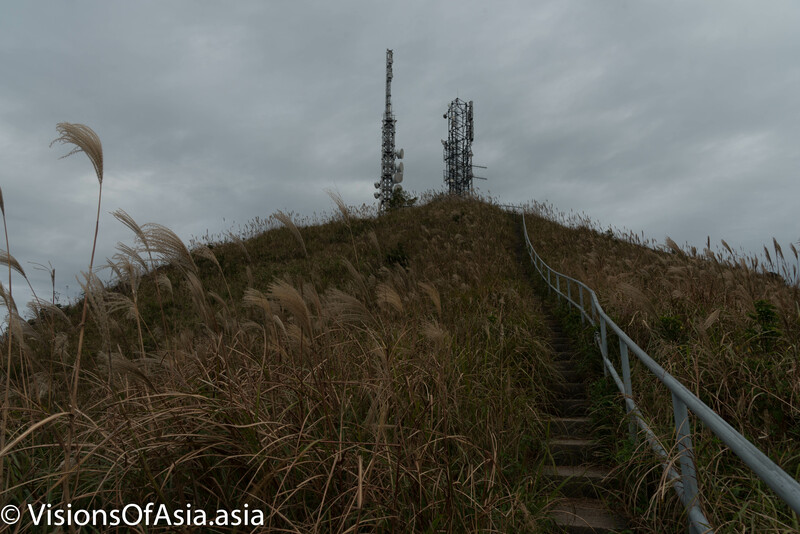 Right now is the ideal season for seeing “silver grass” on the mountain. From what I could see, a number of hikers were happy to take selfies on background of the silver grass. But this should not be the only reason for climbing up there. You should also think about the magnificent views up there, such as the view on Sai Kung. 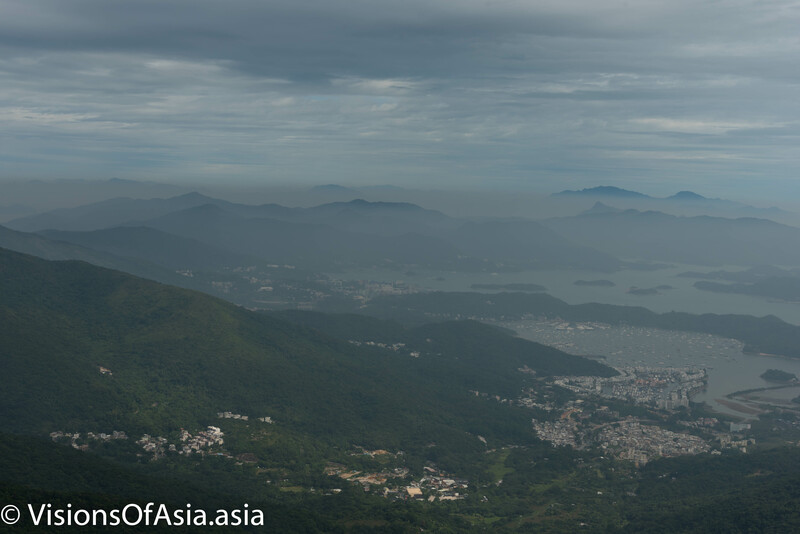 On the first plane, you can see the city of Sai Kung, with, in background, a number of mountains enshrouded in fog. I was lucky enough to arrive early, when the morning fog did not yet clear from the mountains. This gave that famous vapory look so typical of Chinese woodblocks. 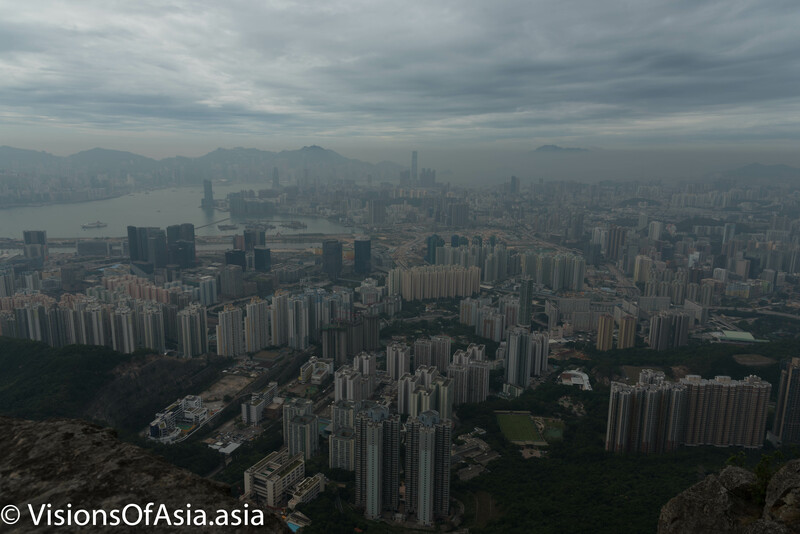 All in all, a wonderful hike, and you are never disappointed by the sights of Hong Kong from Kowloon Peak. However, the heavy circulation also means you encounter 50% of hikers who are unable to hike without a music box.